A Snickerdoodle is a cookie that combines common cookie ingredients- sugar, fat and flour, however what makes the Snickerdoodle Cookie unique is cinnamon sugar, which coats the cookie before it's baked. "But wait, the picture above looks nothing like a cookie?!" 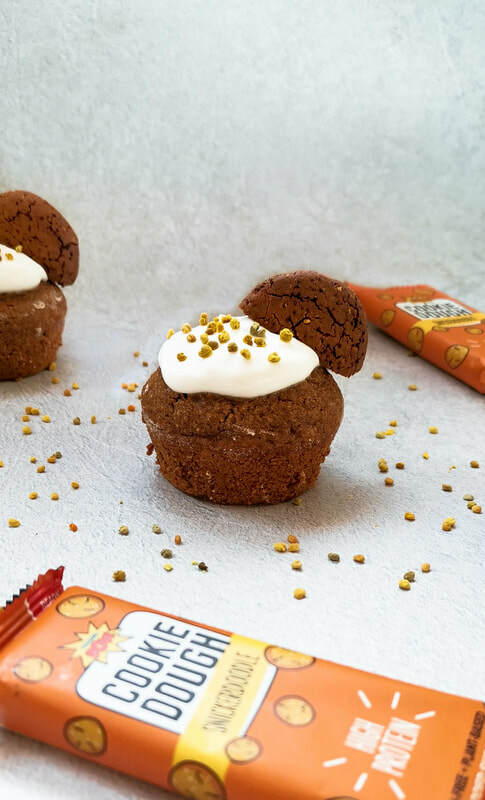 Yes, you're quite right, although here I've created the most mouthwatering fluffy cupcakes inspired by Protein Pow's Snickerdoodle protein bar that tastes just like a real thing, but with another level of nutritional benefits. 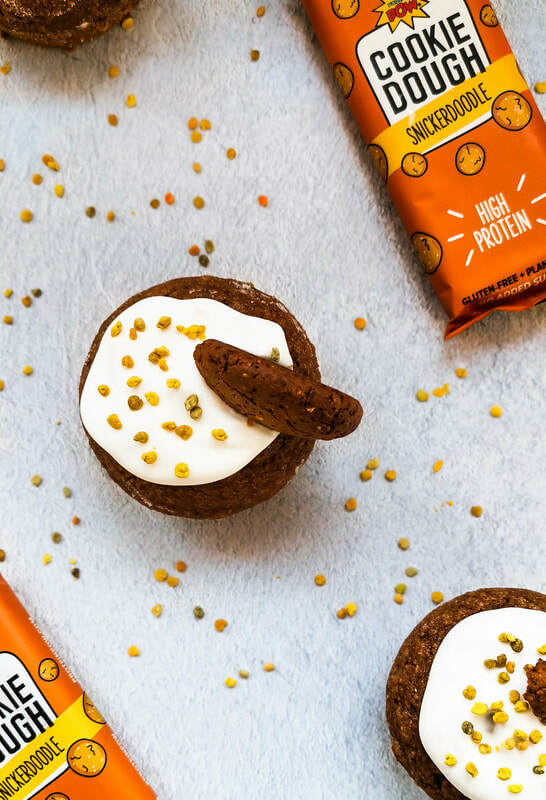 For more information on Protein Pow and other inspired recipes, click here. PS: Be sure to tag me @ballerina_bites so I can see your wonderful recreations! Pre-heat oven to 170°C fan. Grease and flour a x6 cupcake/ muffin tray. In a smaller bowl, stir together the wet ingredients before adding to the dry ingredients. Gently stir together until it creates a thick batter. Spoon mixture between the cupcake/ muffin tray, before baking for 25-30mins or until a skewer is clean when inserted. Meanwhile chop protein bar into 3, before rolling into balls then shaping into a cookie. Bake on a lined tray for 8-10mins or until golden. Allow to cool before slicing in half. 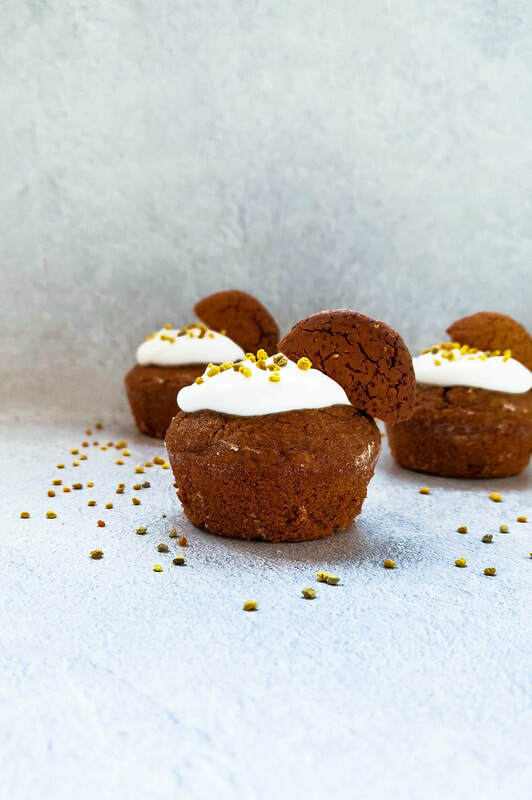 Once cupcakes and cookies are cool add a dollop of coconut yoghurt to each cupcake. Top with cookie halves and finish with a sprinkle of bee pollen. I've haven't celebrated Christmas in Australia for the past two years and was thrilled to be on Aussie soil for the joyous event this year. Previously, I celebrated a Christmas in Stuttgart, Germany with close friends. We had a wonderful afternoon, where we all made a dish, listened to carols, we really couldn't make the day any better. We also attempted to create dairy free Baileys, but turns out I bought the wrong Irish whiskey that had a seriously high alcohol percentage and tasted rather disgusting. The 2nd year I was in Bordeaux, France and spent the day with other dancers who couldn't return home for the festive occasion. We ended up eating at an Indian restaurant because nothing was open. This wasn't the greatest Christmas I've ever had, yet will aways be memorial because of how unique it was. So as you can imagine, being home with my brother (@emerson_cooks) and mum, the food aspect is quite an event and leading up to the big day we had fights over what everyone was making. Typical, haha. ​Soon we came to an agreement and produced quite a spread. 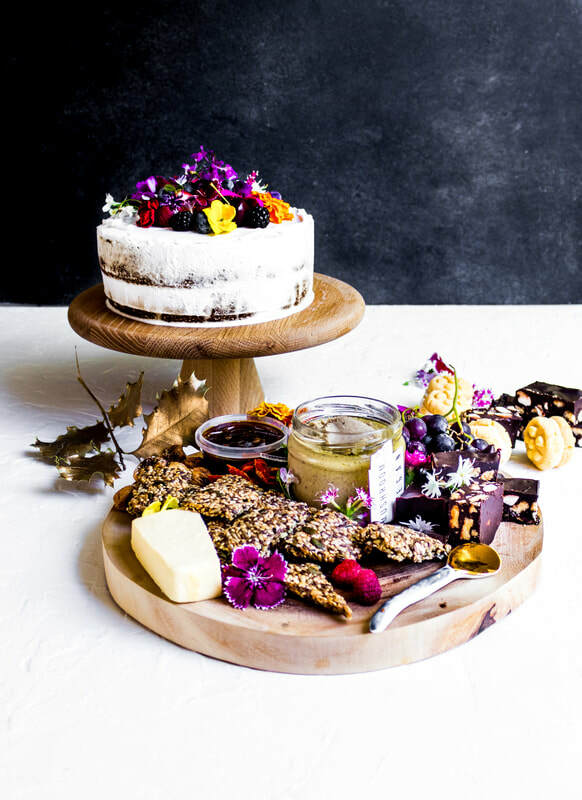 As family members where arriving we created a patter with store-bought hard cheddar vegan cheese and a fermented nut based truffle cheese. The truffle cheese was incredible and I've since made a gnocchi with a creamy truffle infused tomato sauce using the leftover cheese, yum! 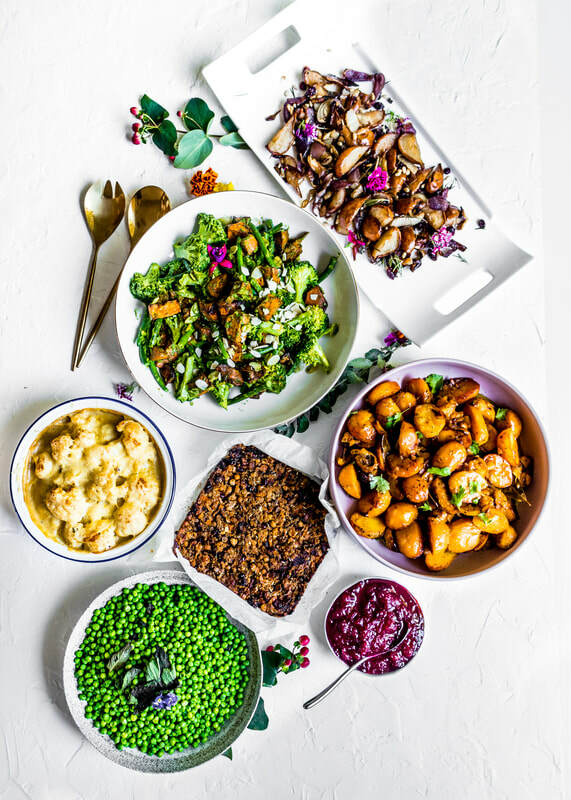 For the main event we made a lot of side dishes to create a delectable feast. ​The extravaganza included: Sweet Potato & Chestnut Stuffing (recipe by Gaz Oakley, Avant-Garde Vegan), Minted Peas, Cauliflower & White Sauce, Pesto Pumpkin & Bean Salad, Roasted Pear & Fennel Salad, Saffron Lemon Potatoes (recipe by Smith & Daughters, Melbourne), Spiced Cranberry Sauce (recipe by Gaz Oakley, Avant-Garde Vegan) and of course gravy. Our drink of choice on the 30°C plus day was a classic Pimms. perfect! Dessert, (you're probably thinking how?!... We did....) combined a few different delights, a nibble of previously mentioned homemade vegan rocky road and yoyo's, as well as a show stopper Victoria Sponge Cake, made for my Nan, who's birthday is also celebrated on Christmas Day. 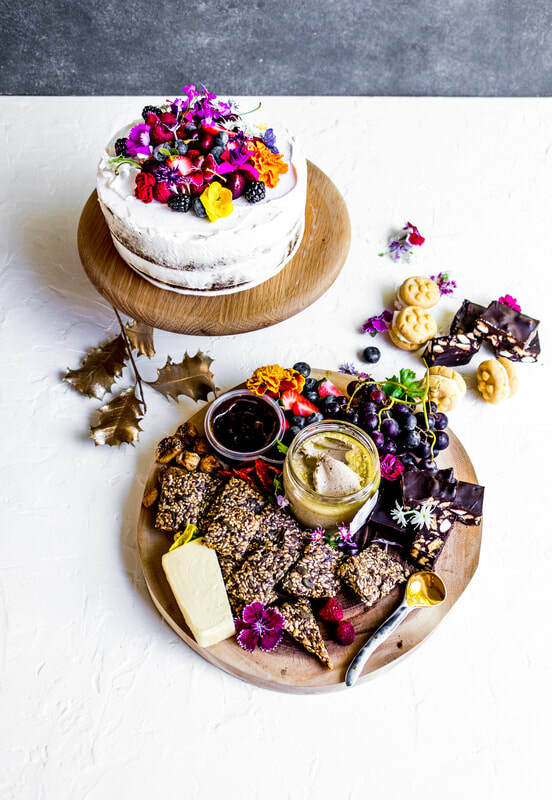 The cake recipe by Deliciously Ella. So there you have it friends, here's what my family and I ate on Christmas Day in a country Victorian town, towards the bottom of Australia. I hope you all had a wonderful festive season too and I wish you all happiness and success in 2019. Allergic to nuts or wanting an alternative to nut mylks? Why not try oat mylk? Oat mylk is creamy with sweet undertones and prefect for any recipe asking for milk, savoury or sweet. This recipe is also is collaboration with Almond Cow. Add oats, medjool dates and salt to the almond cow basket. Fill jug to the maximum line with water. Press the almond cow button and allow to churn. 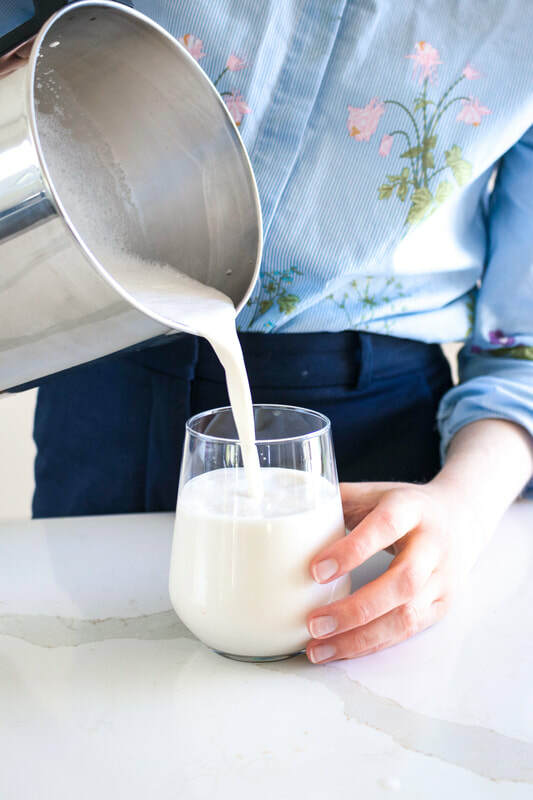 Once the light stops flashing, transfer oat milk to an airtight jug. I too have become conscious of our carbon footprint and how it impacts the world. The increase effects of global warming are because of the advancement of science and human development. This is not a bad thing, we should really be celebrating how far we’ve come since the beginning of time, but today we’re beginning to abuse our resources and over consume. I’m sure you’ve seen all over the web the push for reducing plastic. I too have ‘jumped on that bandwagon’, as I really believe we can suppress and potentially reverse climate change. 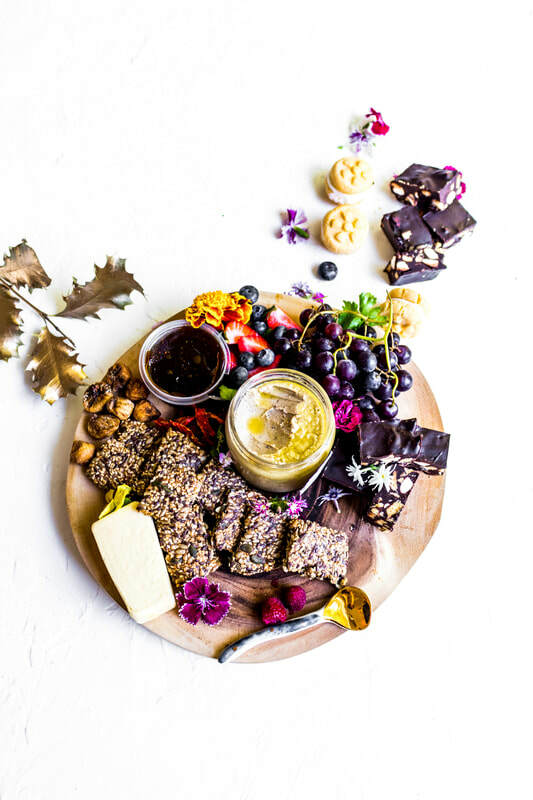 Homemade plant-based mylks taste a whole lot better then the store bought varieties and far more nutritionally denser too, however the only issue people sometimes face, is what to do with the left over nut pulp? 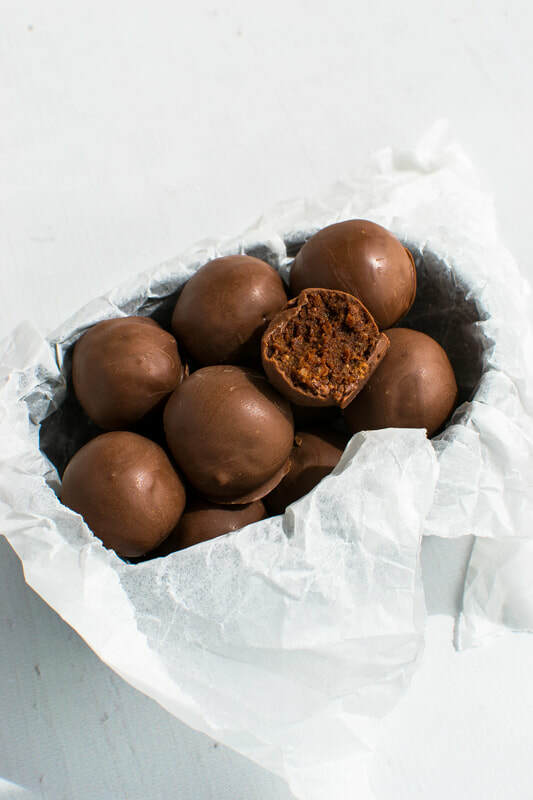 Here I’ve created a recipe, Mocha Balls using left over almond mylk pulp. These beauties are a mouthwatering sweet treat and pair perfectly with your tea, coffee or as a post dinner treat. Note** If you don’t have almond mylk pulp on hand, I’ve listed another alternative, see below. In a food processor, process coconut flakes until a paste. Add coconut sugar, cacao powder, coffee, vanilla, salt and blend until combined. Add almond mylk pulp and process until a ball is formed. Roll dough into ½ tbsp balls. Allow balls to firm in the fridge. Meanwhile melt chocolate in the microwave or over a double boiler. 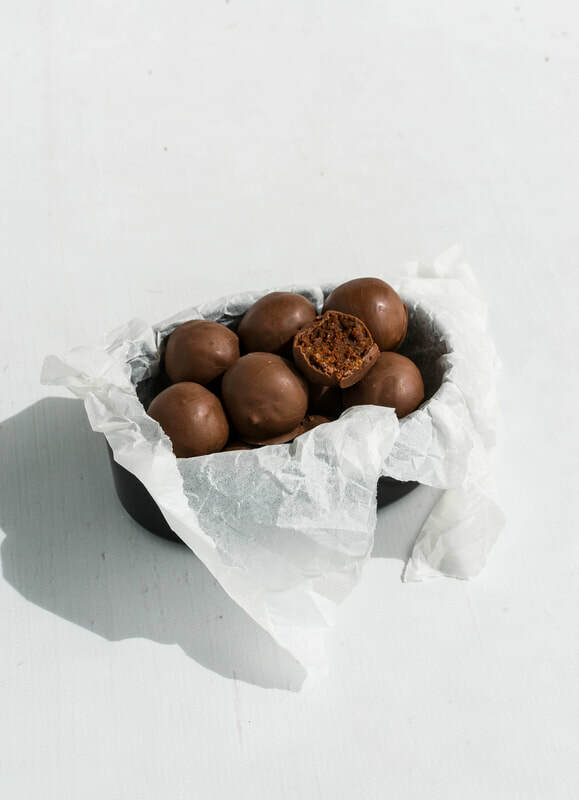 Once melted, coat balls in chocolate and place on a lined tray. Repeat the process until all balls are covered in chocolate. Allow balls to set in the fridge for a further 20mins before enjoying. Note* Please allow the pulp to drain in the almond cow basket so no excess liquid remains before creating the recipe. ** If you don’t have almond mylk pulp on hand, substitute with 1 cup almond meal and 3-4 tbsp water. Feeling like your body needs help with its recovery game? Let’s try adding anti-inflammatory foods into your diet. 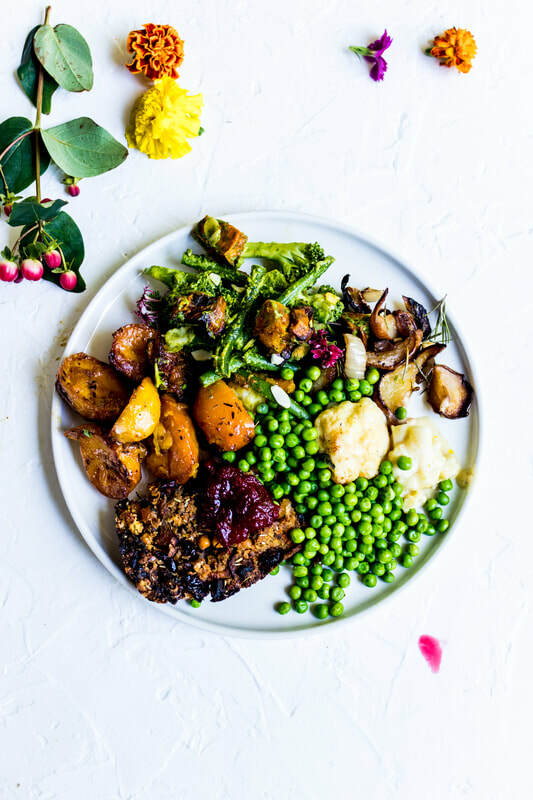 ‘Anti-Inflammatory Power Salad’ a hearty lunch option with an abundance of known anti-inflammatory ingredients including barley, red onion, parsnips, walnuts, goji berries, kale and turmeric. This salad is delicious served hot or cold and can be easily doubled or tripled for weakly meal prep. Pre-heat oven to 170°C fan and line a tray with baking paper. In a small saucepan add barley along with ⅔ cup of water. Bring to the boil, reduce heat to simmer and cover. Allow barley to cook until liquid is fully absorbed. Evenly spread parsnips and onion over tray. Drizzle with oil and season with salt & pepper. Meanwhile prepare dressing by combining all ingredients in a small bowl or jar. Add chopped kale to a bowl, pour over dressing and massage until slightly wilted. Once barely and veggies are cooked add to the bowl. Sprinkle in walnuts and goji berries before giving a good toss. What on earth are Dan Dan Noodles? I asked the same question when watching Donal Skehan’s YouTube video showing the Chinese dish. 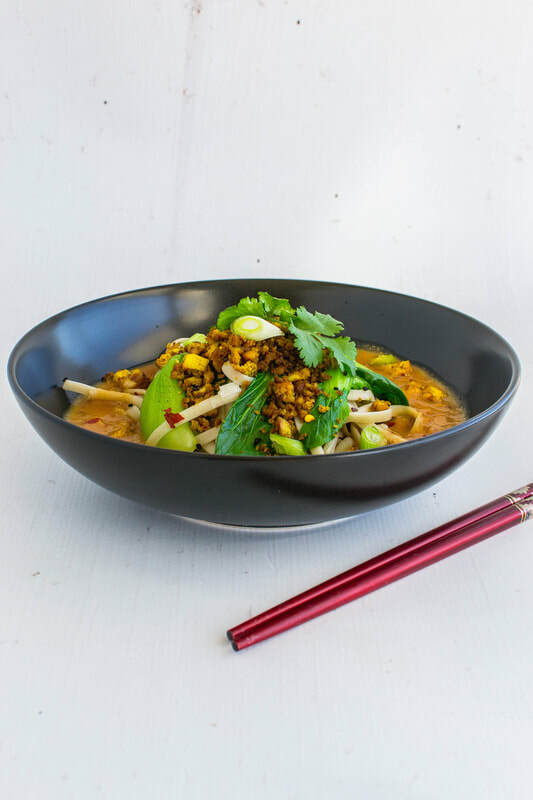 Dan Dan Noodles are made up of a few components; noodles served with a spicy broth, spicy ground meat, as well as Asian greens and spring onions. Donal’s version looked very tasty, but maybe out of my reach as I was lacking some traditional Chinese ingredients. Instead, I decided to create an untraditional variation using whole food, plant-based ingredients. ​Despite being untraditional this dish is jam-packed full of flavour. 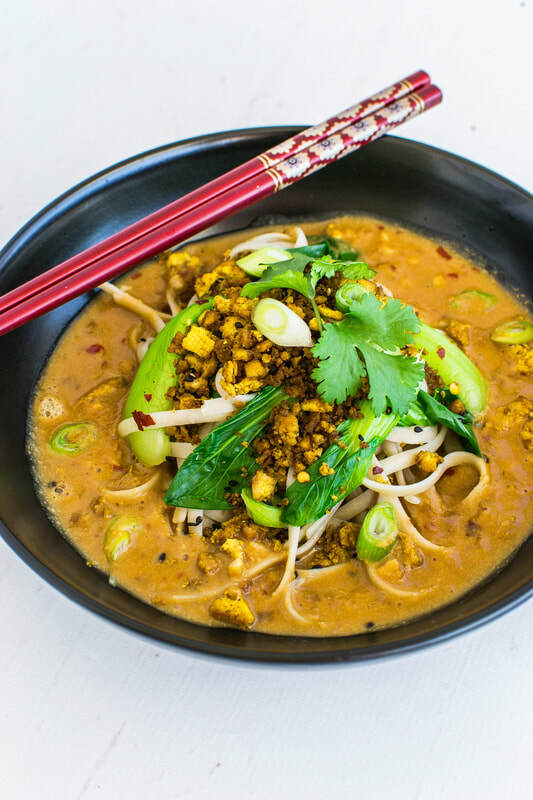 This recipe is the last of 3 recipes in collaboration with Pic’s Peanut Butter. Their legendary peanut butter, using high quality Australian peanuts only combines 1 to 2 ingredients, peanuts and/or salt. After tasting Pic’s Peanut Butter you’ll seriously never try anything else again. To find more recipes using Pic's Peanut Butter click here. In a fry pan, melt coconut oil over medium heat. Crumble tofu with your fingers into the pan. Add maple syrup, tamari, curry powder, all spice, chilli flakes and stir. Allow tofu to fry until golden. Meanwhile add peanut broth ingredients to a small saucepan. Whisk broth and allow to cook until hot, slightly thickened and fragrant. In a large saucepan, fill halfway with water and bring to the boil. Once boiled add noodles and cook according to packet instructions. Midway through cooking, add bok choy to lightly wilt. Once cooked drain liquid and divide noodles and bok choy between two bowls. Pour over peanut broth and top with Spicy Tofu Mince. Garnish with spring onion, coriander and a wedge of lime. Thanks to our Anglo-Saxon heritage we love a good morning or afternoon tea. This ritual generally involves a good “cuppa” and if we’re lucky, a mouthwatering homemade scone. Growing up, I have fond memories of whipping up a batch of scones with Nan and baking them in a tiny camper’s oven. I used to think it was incredible, with simple ingredients and somewhat questionable equipment we’d always create a wonderful delicious treat. 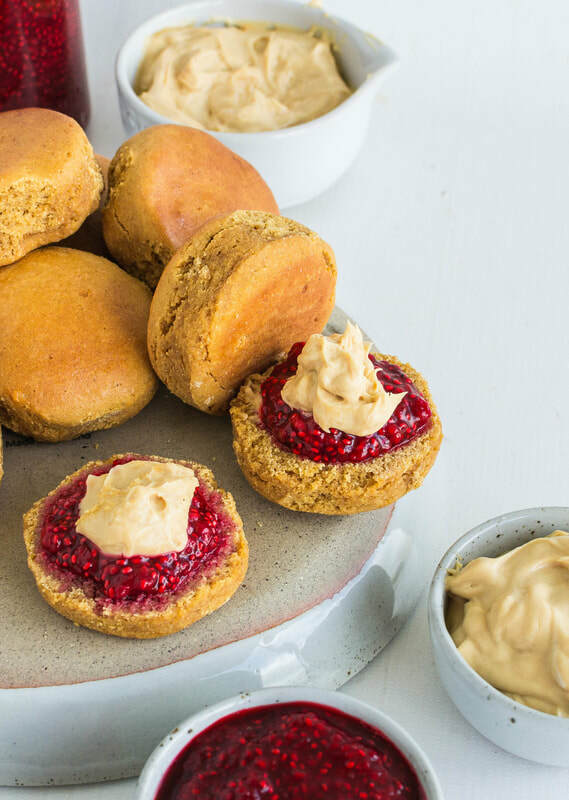 Here I have my own version of scones with a surprising little twist of infusing them with Peanut Butter! 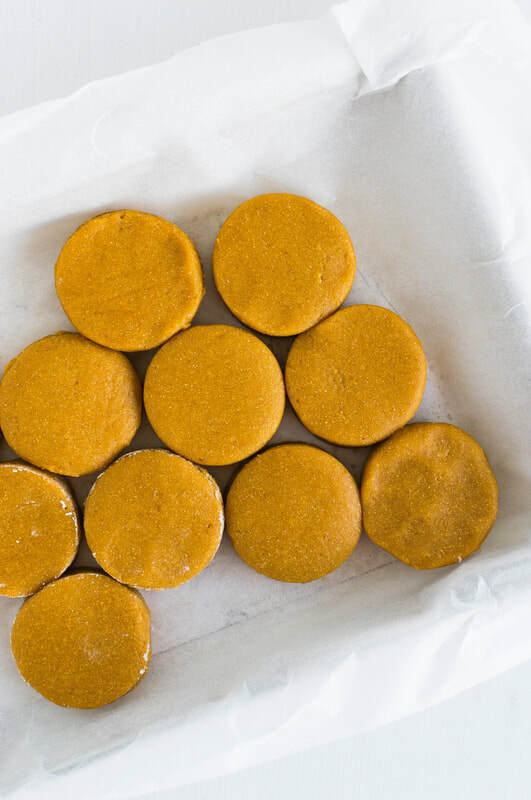 Yes, this recipe is the second of my recipe collaboration with Pic’s Peanut Butter and I must admit I’m pretty excited to share this recipe with you. Begin by making the Raspberry Jam by adding the raspberries, water and maple syrup in a small saucepan. Over medium heat allow jam to bubble away until liquid evaporates and begins to thicken, stirring throughout. Stir through chia seeds then pour into a jar or bowl. Allow jam to set in the refrigerator. In a large bowl combine flour, almond meal, coconut sugar, baking powder and salt. In a smaller bowl whisk together mylk and peanut butter. Add wet mixture to the dry and using a wooden spoon or hands combine until dough is formed. (If dough is too wet add a more flour or too dry add a dash of mylk. It will depend on the flour you use). Once dough forms a ball, place between two pieces of baking paper and roll with a rolling pin. Aim for 1.5cm in thickness before using a scone cutter or small rimed drinking glass to create individual scones. Place scones on prepared tray so they’re slightly touching. Using a pastry brush, brush each scone with a light coat of mylk and bake for 20min or until golden brown. Meanwhile prepare PB Cream by whipping together all PB ingredients; you can use a hand or electric whisk. Scoop PB Cream into a small bowl and set aside. 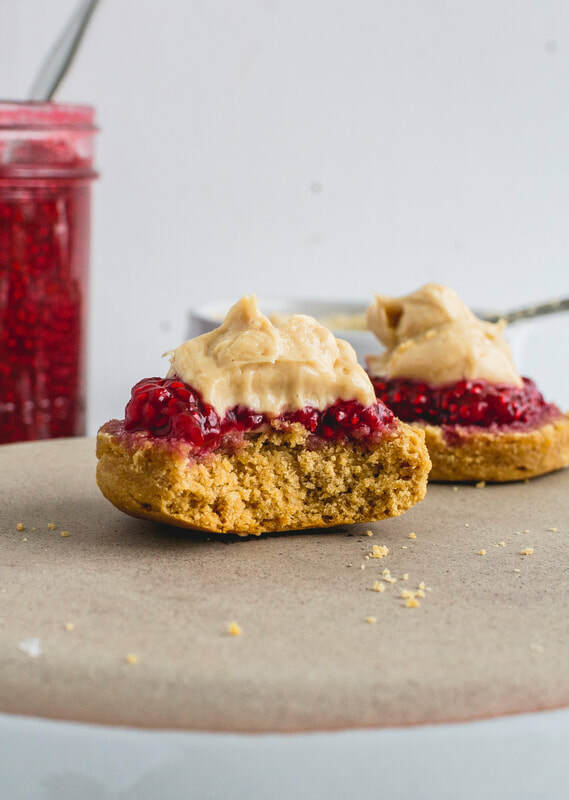 Once scones are golden slice in half and dollop with Jam and PB Cream. Scones can be served warm or at room temperature. Scones are best the day of bake. I needed to make a blank canvas for my recent recipe Blueberry Compote. Porridge would be a good option, but I've shared enough bowls of oaty goodness on my blog and Instagram already. So," what else is there?" I've seen raw buckwheat porridge before by foodie icons Green Kitchen Stories & Oh She Glows and always shied away as I simple love my oats. But with a full packet of untouched buckwheat in the pantry it was time to give it ago. Raw Buckwheat porridge is rather similar to overnight oats with the only differences being raw buckwheat porridge has a smoother texture and the flavour enhances are added the following morning. Here I have a basic recipe with classic flavours maple syrup, cinnamon and vanilla, leaving you room to be creative with the toppings. Drain and rinse soaked buckwheat groats and add to your smoothie blender or Nutri Bullet. 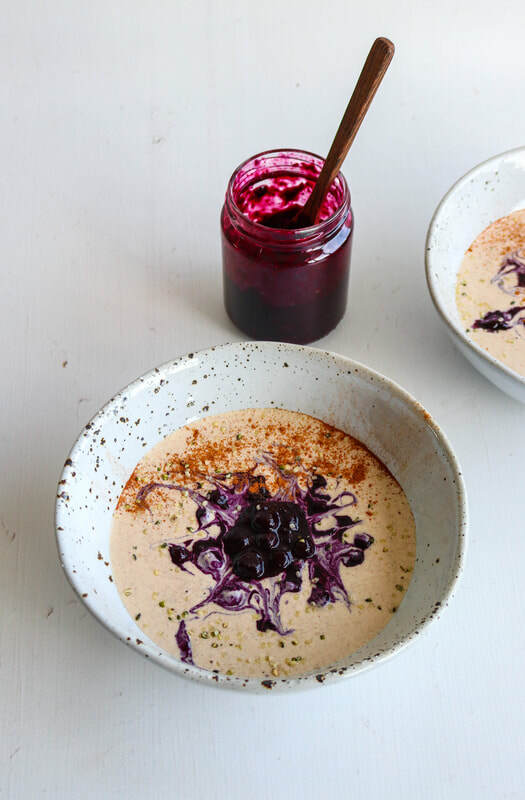 Serve porridge between bowls or jars and top with your favourite toppings such as Blueberry Compote, nut butter, nuts & seeds and/or fresh or dried fruit.